After 25 years of operation, cruising icon Herb Hilgenberg has decided to end his weather forecast and routing service, South Bound II Coastal, call sign VAX498. Since he started, Herb has become something of a structure in the East Coast and Caribbean cruising communities. After 25 years of operation, cruising icon Herb Hilgenberg has decided to end his weather forecast and routing service, South Bound II Coastal, call sign VAX498. Since he started, Herb has become something of a structure in the East Coast and Caribbean cruising communities. Seven days a week, any sailor could check in with Herb, give his or her position and local conditions, and receive a customized weather routing report. Herb ran the free service from a small room in his home. Herb’s forecasts covered waters within the North Atlantic between the Eastern Seaboard and Europe, as well as the Caribbean, the Bahamas and the Gulf of Mexico. The service was created to assist with extended offshore trips. According to the announcement on his website his decision came in part from the negative feedback he received after the 2011 North American Rally to the Caribbean (NARC). If you’re not familiar with the incident, here’s his account. 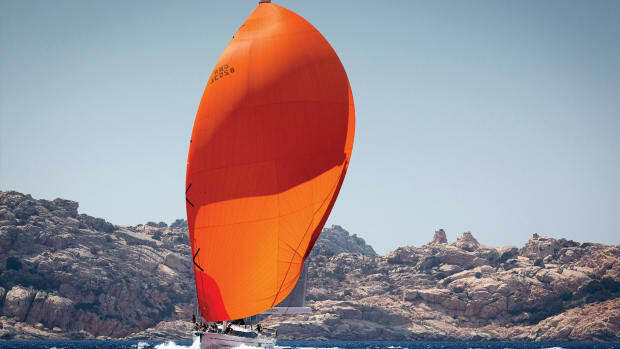 Starting in 2012, skippers had to preregister with Herb for the weather and routing service. That was his way of slowing down call traffic and making his descent to retirement.  Herb Hilgenberg began sailing in Newfoundland in 1953. He earned a B.S. in Engineering and an M.B.A. from the University of Toronto and a certificate in meteorology, a subject that proved useful in his future endeavors. Hilgenberg moved to Bermuda in July of 1984, where he discovered a new hobby: weather forecasting. He found that many yachts were experiencing heavy weather when traveling between the Eastern Seaboard and the Caribbean, often resulting in casualties and boat damage. By 1987, Herb had brushed up on his forecasting knowledge and secured an advanced amateur radio license. Thus, South Bound II was up and running. Within three years, Herb was sharing information with the U.S. National Weather Service in Virginia and the U.S. Naval Air Station in Bermuda. His forecasts became essential in races like the Marion-Bermuda and the Newport Bermuda. Herb retired from his desk job in Bermuda and returned to Ontario, Canada in 1994. He became licensed by Industry Canada, which allowed him to operate a marine HF from his home. Herb Hilgenberg received the Queen’s Golden Jubilee Medal in 2002 for his accomplishments. 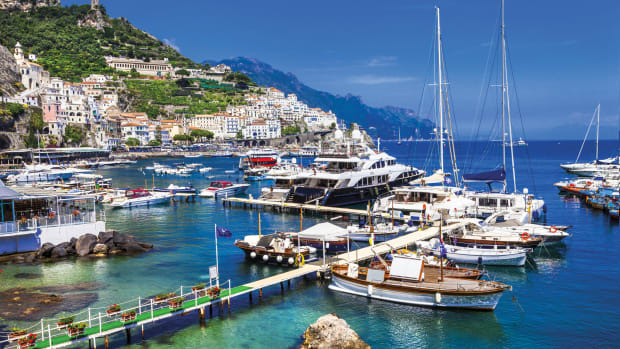 If Herb Hilgenberg helped you and your boat safely reach your destination some time in the last 25 years, send us an email at sailmail@sailmagazine.com detailing the experience. Sylvia Stewart:"November 1996, Herb helped us with our Ft Lauderdale to St Maarten passage on the Ocean 71 Big O. There was some serious weather North of us and he kept us appraised of that system. We had days of 25 knot tailwinds, a wonderful trip! Thank you Herb!" In 1986 I left the UK in a 45ft Ketch Lumberjack and made contact with Herb for weather reports as we sailed to Spain Portugal Canaries and across to Barbados. Heading south to Tobago and then right through the Caribbean to the Bahamas and north to Bermuda and west to Newport, Rhode Island. Even though I had a weather fax linked to the SSB giving twice daily weather print outs, Herbs conversations not only with us but with all the yachts scattered around the ocean, painted a far more detailed overall picture. Again in 1992 another two way Transatlantic trip was made in our Hood 52 Hoodwink from the UK Canaries, St Lucia then after several months cruising, heading back to the UK via Bermuda and the Azores. This time we had daily contact with Herb&apos;s net and I have to say what a great service and reassurance this was. Whilst in Bermuda I had the privilege of going to Herb’s home, meeting him and his wife and being shown their "operations room" which was brilliant. They both devoted their whole lives to seeking all the relevant input from every available source to correlate their weather maps etc. In our conversation he was very specific regarding the way in which he transmitted his findings to yachtsmen on his net. He never actually told anyone to take any course of action. As he told me when we met, he would never give anyone any definitive instruction, indeed emphasizing that it was their decision to make. Every skipper on every yacht had to be the final decision maker for the safety of his vessel and its crew and he stated this on many occasions. I am very saddened that his great service to amateur yachtsmen has come to an end by the suggestion that Herb was, even remotely, in any way connected to the loss of life in the tragic events reported on the web. Shame on all those who have the nerve to even suggest such a thing. The skipper of all vessels at sea are the decision makers and any outside information gleaned from any source should be carefully weighed up as to its usefulness in the decision making process. The buck stops there. 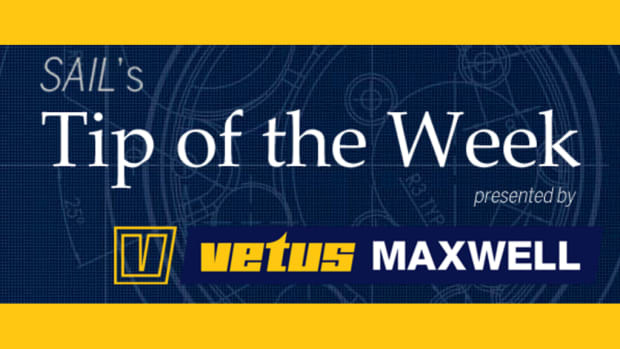 On behalf of the many thousands of yachtsmen who have benefited from Herbs invaluable net I would say a huge thank you for all those years of free service." Markham Anderson:"It was a comfort and an honor to talk with Herb on our passage from Cape Fear to Tortola several years ago. He was already a legend then, and I was pleased to have a reason to hear his calm, gentlemanly voice on the SSB. Please extend our thanks to him for all the good he has done over the years. We wish you well, Herb." One night, as we approached the south coast of Ireland, Herb told us to stop and hold our position to allow a gale ahead of us to pass on. However, friends on a boat who were just then arriving in Ireland radioed to say that the gale was not a problem and that we should come ahead, which we did. Our friends were right, but the following night I was afraid to contact Herb – he would know from our position that we had ignored his recommendation. So, being the brave sailor that I am, I asked my wife to check in with Herb and explain. She did, and Herb went easy on her. Of course, she still reminds me of my “bravery” from time to time. We cannot imagine a crossing without Herb. Hopefully, someone will start providing free, accurate weather advice, but no one can take his place. Thanks again, Herb." Ted Dalaku: "We knew the day would come, and it is certainly well deserved, but we&apos;ll miss Herb&apos;s broadcasts. 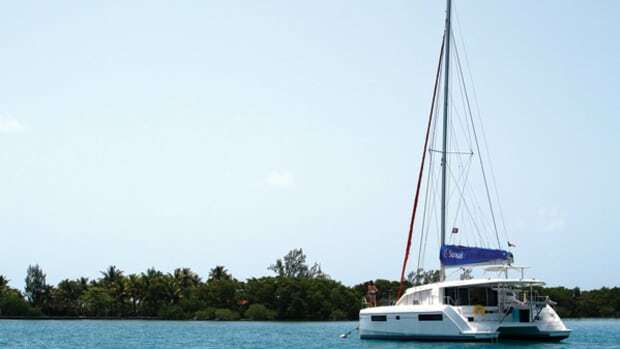 In the 2004 NARC, I joined my sailing buddy Ken and two of his acquaintances, Jeff and Garret, in delivering Ken&apos;s recently acquired 1994 Lagoon 42, Minx, to the Caribbean via Bermuda. Our departure from Newport had been delayed for a few days because of weather and most of the crews were getting restless. At the morning weather briefing the NARC weather advisor suggested that we should delay further but it seemed that there might be a window if we left immediately. Since the lead boat and another cat were leaving, we chose to try to beat the approaching storm as well. The following morning conditions began to deteriorate. The morning NARC net on vhf confirmed that some boats were returning to Newport but we continued making good time. On day 2 we tuned in to Herb&apos;s Southbound 2 broadcast on SSB and he advised us of the approaching gale. He predicted winds up to 60mph. He then gave us a GPS point to head to that would take us back towards shore and into the gale before it had time to build even further and advised us that, if we could stay there, the gale should pass by 0200 and the wind and seas would subside and change to a more favorable direction. He was concerned enough that he said he would break protocol and call us at 9am to following morning to check our status. We decided to split from the NARC boats and take his advise. We sailed and motored to the GPS location he had given us and held the boat into 25 foot seas with breaking tops and winds that logged 59.8kts. By 0145 the wind had changed direction and the seas began to subside so the watch turned Minx back on course to Bermuda. When the sun came up we were about 2 miles from the fleet. Some of those boats had damage or lost systems but we had none. My wife had been monitoring our contacts with Herb on a portable receiver and heard him call us at 0900. We were on the NARC vhf net and missed his call. She became concerned and tracked down Herb&apos;s email address and asked if he had heard from us. He replied that he would try again at the regular 1500 broadcast and she should listen then. That afternoon she was not able to hear the broadcast because the storm had hit the Newport area. More worried than before, she emailed Herb again and she told her our message that "nothing broke and nobody died" and we were OK.
About 2 days later we were off Kitchen Shoals and made vhf contact with the lead boat which was only 1 hour ahead of us. They had lost some navigation aids and lights in the storm. Herb&apos;s weather predictions and condition reports were on the money for the rest of the trip to Tortola and all of us on Minx were grateful to have him on board." 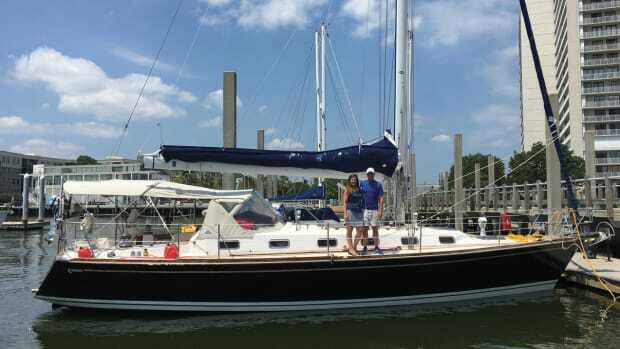 Guy Rivers: "I was new to cruising in 1998 after buying and retrofitting a catamaran in Ft. Lauderdale, FL. Two friends and I set sail on Halloween across the Gulf Stream to San Salvador Island, Bahamas. From there, we sailed through the Windward Passage to the Panama Canal. Herb Hilgenberg was on the SSB every night giving us our weather forecast. I was living the perfect adventure, checking in with Herb, then listening for 2 hours as he masterfully worked his way from boats crossing the Atlantic to the Caribbean, to fishing vessels in the Atlantic Ocean and Caribbean Sea, and finally to the few of us in the middle of the Caribbean heading to Panama or the San Blas Islands. It was all so fascinating to me, a new cruiser with most of the world to see, to hear Herb communicate with these boats and visualize what is was like where they were. Herb called my boat by name, and he talked with me just like he was talking with the veteran skippers ahead of me. I learned so much from those brief conversations, and I still tell my story about Herb Hilgenberg whenever I talk about sailing. After transiting the Panama Canal, we headed north. I was fortunate enough to have one last conversation with Herb before going out of radio contact. Herb, thank you for 25 years of dedication and support to the cruising community. You made a tremendous impact on me, and countless others I’m sure. We will all miss you on the radio!" John Dennis: "I sailed back from Guatemala to Maritime Canada this past June and had Herb aboard for most of the passages. Our trip from Bermuda to Nova Scotia was quite nasty having to resort to emergency tiller midway. 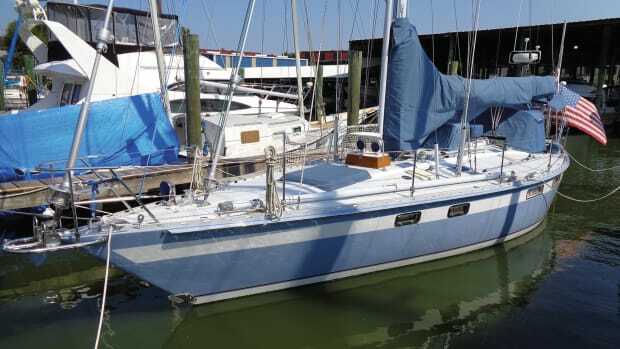 I started sailing in 1981 and had Herb’s help from 80s on for six transatlantic trips and 15 times to the Caribbean and back. I always paid attention to him and did what I was told, as Herb did not appreciate otherwise. After getting home in June I emailed him with appreciation and thanks. I got a nice email back and he said I was his last contact. What a guy!" Ralph Talbott: "Sorry to learn that Southbound II is retiring, but it is well deserved. He has guided many cruising sailors in the North Atlantic and I am one. I met Herb during the TransARC of 1992 in Bermuda. 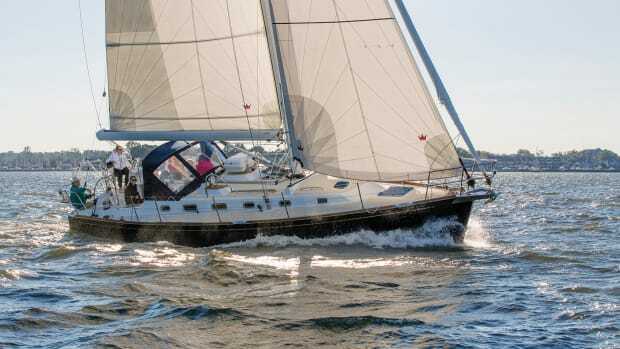 I was a novice offshore sailor on a 33’ Nauticat TIEVOLI heading to Spain to be in the America 500. Unfortunately the transmission needed to be replaced so I was not able to depart for the Azores with the rest of the fleet and was delayed ten days. So the late Ray Trotta, brother Vince and I headed off alone for Horta. Daily Herb would give us weather forecasts and on one day he cautioned us of a low in our path and suggested an alternate heading. Immediately we made a course change that added a day to our voyage, however we totally missed the gales that Herb predicted. It was a blessing and comfort to talk to Herb daily for weather and information. On the return voyage the whole fleet would benefit from Herb’s guidance during 1992. We wish him well, fair weather, and many enjoyable years. He deserves the rest." Bill Heller: "Many years ago, I was crewing on a 65 ft Swan, which was being delivered from Antigua up to the Long Island Sound area. We were a bare bones crew of four: the French captain, Italian cook, myself, and another guy, origin unknown. I had crewed on previous voyages, to Bermuda, and other islands, always as a string-puller; nothing more, but I knew all about Herb, and had great respect for him. So, I asked the skipper if I could check in with Herb, so he could track us as we proceeded North. He said that I could, and I&apos;m sure he had no idea of what I was doing. One day, I checked in, and Herb told me that in order to make a quick shot through the Gulf Stream, we should proceed to a waypoint that he provided. I showed this to the skipper, who immediately disagreed with this course, saying that it would take us some 60 miles out of our way. I pleaded with him, saying that Herb knew what he was doing, and that we would benefit greatly from his advice. The skipper finally relented, grumbling about crazy Americans, etc. Of course everything worked out perfectly; we sped across the stream with no problems, and heard some vessels on the SSB who were not so fortunate. Herb always did a great job, shepherding all sorts of vessels through all kinds of weather situations, guiding them safely all the way. I no longer crew on these passages; too old, but I know that all those sailors out there will now be setting out without the benefit of Herb&apos;s great advice. He will be missed." Eric Freedman: "I am very saddened to hear of Herb’s retiring. I have used his graciousness for over 20 years and I have always found him to be my guardian angel, including getting me through hurricane conditions of over 36 hours. He has routed me flawlessly up and down the coast of Europe and from the coast of Africa to the Caribbean, and about another 45,000 sea miles including about 26 trips between the Caribbean and Long Island. He also helped with a solo nonstop 12 day sail from St .Martin to Long Island. I happened to be in contact with Triple Stars before they crossed the Gulf Stream and they seemed a little confused about sailing in general. They were concerned about the weather forecast and asked me how to get in touch with Herb. During the time of the Narc Rally, which had nothing to do with Herb, I followed his instructions to the letter and sailed quite east and arrived flawlessly in St. Martin a week ahead of the NARC rally. I would much rather have been at sea than facing 40-50 knots in St. Georges Bermuda. How can one even think of attributing Herbs advice to someone being lost due to a novice error of not clipping in? I will miss you my guardian angel. Thank you for all the years tireless help and service."